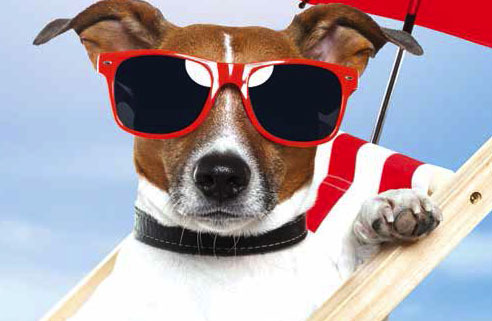 Summers are a great time to enjoy outdoor activities and spend some quality time with your four-legged buddies. Out of all the summer activities, swimming is one activity that would help you nurture the bond with your pet exponentially. And it is also a great exercise for your pet, which means a double whammy. But doing all in safe and sound manner must be the priority in all aspects! your pet as well. But training combined with your encouragement will help them overcome the fear. As a responsible pet parent, one must understand that not all dogs are great swimmers. There are chances that your dog might not like swimming. So, don’t force the pet at any stage. This might just increase his phobia to water. Recollecting some amazing swimming experiences of dogs who swam during their camps, Pooja Sathe remembers feisty Labradors at Crazy K9 Campers in Mumbai who wanted to dive in the pool from the very first time and some shy mixed breeds took their own sweet time to even get into the river water. “Romeo and Barbie, a Labrador duo, absolutely love water and enjoy swimming, be it in the pool or river or beach. They always have to swim together and love fetching stones from water. We were surprised to see that they could even fetch the stones from under water,” she mentions. “Ginger is a female German Shepherd. For the first few times she absolutely refused to get into the water and couldn’t understand what all the crazy Labs were fussing about, around the swimming pool. We then tried encouraging her to walk in the water on a shallow river bank. When she saw her dad going inside the water and waving at her, she finally gathered courage to get in. Once she got the hang of it, there was no stopping her then,” recalls Pooja. 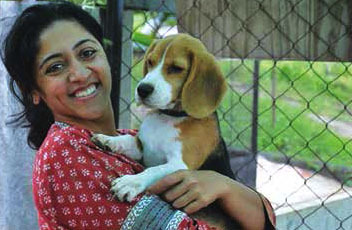 In her story, she mentions about Mirchi, a mixed breed, who has been a regular participant and understands the camp routine so well that she smartly keeps her distance from the pool but as soon as she goes to any river for a swim she is eager to get in and today she has even learnt to fetch toys back from water. As her memorable experience, Shalaka Mundada shares that a Golden Retriever called Laila who stays with them regularly at Pet Sitters in Pune, enjoys sitting on the ramp just to cool herself off as if waiting for her drink to be served pool side. “It’s a dog’s life! Nowadays with pet parents going all out to provide best of everything for their pets, this saying has completely changed meaning. We want to give our pets the best of food, toys, beds, training, clothes… the list is endless. The latest addition to this list can be giving our pets best of exercise or a chance for some exciting outdoor activities. In this, swimming can be the best outdoor activity for pets as it’s very enjoyable for most of pets, it also helps them keep fit and can also help dogs with arthritis,” says Pooja Sathe. Is every breed a swimmer? 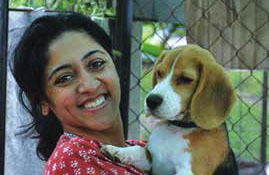 Pooja further mentions that other breeds such as Boxers, Bulldogs, Dachshunds, Pugs, etc may find swimming and staying afloat difficult due to their body structures i.e. heavy body, short noses, short legs, etc. In this context, Shalaka Mundada shares, “Pet parents must take care of some breeds who have short legs and flat noses. Such breeds should not be in pool unattended and without life jackets and long leashes. But most of the Retriever breeds just enjoy water!” Above all, Pooja advises that pet parents must also remember that each dog is different and if they enjoy swimming or not can be entirely dependent on their individual preference. If introduced to the water correctly all dogs can learn swimming and enjoy the experience. Pet parents must keep certain safety points while introducing their pets to pool swimming. Shalaka points out that too much water must not enter in the pet’s ears as it can lead to infection. “Before entering the pool, the pet must be given a thorough brushing to take care of all loose and dead hair so that they don’t accumulate in the pool. Look out for any sign of the pet getting tired. If swimming is not his normal/regular activity, the pet can get tired quickly,” she advises. On a similar line, Richa strictly mentions not to leave dog unattended in a pool, especially in deep pool. “There should not be any sharp object or structure in the pool which can hurt dogs. There should be a resting place where dogs can climb and take breaks. Most of the dogs do getting in and out of the pool themselves once they become comfortable with water. But some support/help initially,” says Richa. To this point, Shalaka mentions that there should be ramp for the pet to get in and out of water; most pets, who are entering for the first time, may not jump inside even if it’s shallow; so, a ramp eases it out for them to get in and out of the pool at their convenience. Shalaka mentions to check whether the water is chlorinated or smelly. “If not filtered or cleaned properly, the water can smell and it’s not good idea to get your pet into that water.” To this point, Richa says the use of chlorine in pool water is what it gives skin infections to dogs, if the dosage is inappropriate. Shalaka advices that pet parents should consult vet before getting a pup (less than five months) into water as immunity systems of the young pets are not developed and there might be a chance of an infection catching on. “Once the vet has given a go ahead signal, introduce the pup to the water with his favourite toys and get him to do fetch in and out of water. If there is an adult dog who swims and your pup is friendly with him, you can also do a joint session for both,” she explains. Be careful with pups. They just leap before they look or fall simply into swimming pool and can’t get out easily. Some breeds like Collies having heavy-coats and heavy-bodied Bulldogs often face trouble in staying afloat, they don’t sink, but unable to get out of the pool. 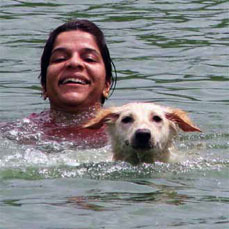 According to Pooja Sathe, there are certain Dos & Don’ts for pet parents who wish to take their pets to swimming. 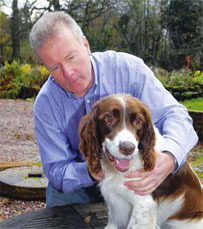 Introduce your pet to a water body gradually. Do not feed heavy meal at least one hour prior and immediately after swimming session. Most of pets feel more confident and comfortable if the pet parents join them in the water as well. Usually pets prefer a water body where they can walk into the water, instead of having to jump in it, especially if it’s their first swimming session. Thus it is a good idea for city pets to introduce them first to the beach water or shallow river and once they are comfortable then take them swimming in the pool. Safety is always a priority, even if your pet is a pro swimmer or just learning to swim. Use comfortable and well fitting body harness instead of a tight neck collar or chock chain. Also using a cloth leash or extendable leash with it can be very useful. It’s advisable to use a life jacket on pets at least for the first few swimming sessions. Keep the swimming sessions short and give pets enough rest time and pee breaks in between. Try to avoid taking pets for a swim during peak hot hours during the day. Early morning or late afternoon/evenings are better, as they won’t get tired too fast. Use the swimming pool’s stairs to walk the pets inside. Do not push them from the edge, as they can get hurt easily from concrete edges of the pool. Preferably take the smaller breeds in the kid’s pool section for first few sessions. Tired pets can get drowned very easily, so always pay attention to pet’s body language for any signs of stress or tiredness, etc. While you are teaching your pet to swim, it’s better to hold one hand under the pet’s belly for support and other firmly on top of the back holding the body harness. Most of the pets naturally start paddling movements once inside the water, even if they don’t know swimming. Still it’s always better to give them enough support from under their body till they learn to float on their own. Some short nose breeds may find swimming or staying afloat on water harder than the bigger breeds due to their body structure. Pet parents must assist them all the time during swimming session. After swimming it’s necessary to wipe them completely dry and also clean their ears. Comfy with water: Introduce your pet to swimming slowly and don’t rush. You can consider buying a kiddie pool and letting your pet practice. This would help him become comfortable in water. Make it fun: Let it begin as a play session and not a serious activity. Toss your pet’s favourite toy in the pool and encourage him to fetch. Way out: Make sure that your pet knows the way out of the pool. Stairs or ramp, whatever the option is, let him explore it and get used to it. Life jacket: Buy a life jacket or a life vest for your little one. The jacket ensures that your pet stays afloat. Once the pet is wearing the life jacket, you can be assured of his safety. Water chemical balance: The chemical balance of the pool should be correct or else it can have harmful effect on your pet’s skin. Water…not drinkable: Make sure that your pet does not drink water from the pool. The swimming pool water with high chlorine content can trigger gastrointestinal infection. Be at their side: Never leave your pet unattended during swimming session. Vet recommendation – a must: Consult your vet before allowing your pet to swim. Some vets might not recommend swimming for certain breeds and senior dogs. (With inputs from Pooja Sathe, a certified dog trainer & founder of Crazy K9 Campers in Mumbai, offering pets and pet parents unique opportunities to spend quality time together through weekend pet camps; Shalaka Mundada, a certified kennel owner and canine behaviourist, who runs Pet Sitters pet resort in Pune; Richa Maheshwari, who runs Café Canine in Gurgaon, a place conceptualised to enhance bonding between pets and pet parents; and Kritika Manchanda). Learn about Heat STROKE & SAFETY Healing power of Reiki & how it helps?